The Gold Eagle is the official gold coin of the United States Mint. Its 22-karat (or 91.7% pure) gold content makes it harder and more durable than most highly pure gold coins. People quickly recognize the Gold Eagle’s patriotic design, which is why it is preferred by traders, investors, and coin collectors all over the world! Introduced in 2006, the Gold Buffalo was the United States’ first ever 24-karat gold coin, struck from remarkably pure .9999 fine gold. 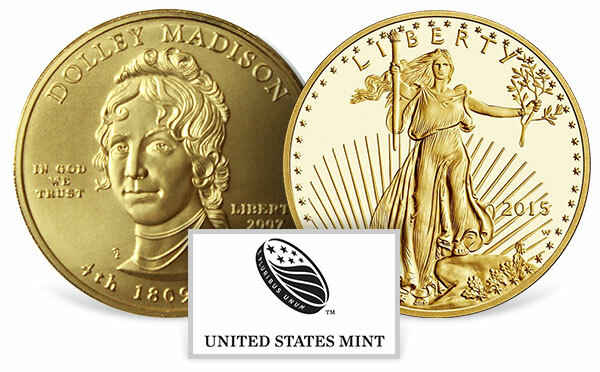 Many commemorative coins released by the U.S. Mint have a gold version. These coins are always 90% pure gold and feature some historical and cultural theme in their design. Gold commemoratives also have the advantage to collectors of being produced in very limited quantities! Introduced in 2007, this series of 99.99% pure gold coins honors the spouses of each U.S. president. It marks one of the few times that historical female figures have appeared on U.S. money. These coins contain one-half ounce of gold and correspond to the Presidential dollar coin series.